Here's an image I created over the weekend. The Mindful Eye, a photography Forum I read nearly everyday, has an ongoing member challenge of "Food and/or Drink" and a Community Assignment of "RGB Color." My family and I came up with the idea of the picture below that I could use for both assignments. What could be a more balanced meal than chocolate mm's from all the major food groups (or at least colors). 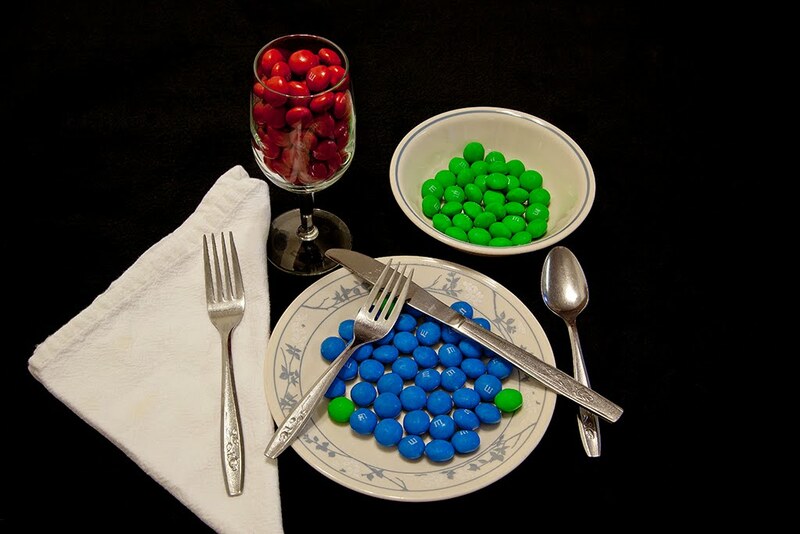 To create this image, I obviously started with a bag of mm's -- actually two bags, that we separated into colors. The table setting is on a piece of black fleece fabric and I capture the image with regular room lights. To help remove some of the glare from the glass, I used a trick I learned in the book by Fil Hunter called Light, Science and Magic. I placed a polarizer filter on my lens and captured two images, rotating the polarizer 90 degrees between captures. I then combined the two images in Photoshop. What do you think? I look forward to your comments.